​The presence of rats inside your home can easily lead to a lot of serious problems. Although your first instinct tells you to just deal with the problem on your own (and save yourself the expense of calling a professional), experts will most likely tell you to consider otherwise. ​Should You Call for Rat Infestation Control? What Should You Do When the Exterminators Leave? ​Should You Tell Your Neighbors Anything? So, you just saw a rat scurry across your kitchen. Is it just a single rodent that accidentally found a way into your house, or is it already a sign of rat infestation? Should you handle the problem yourself or should you call for a professional rat exterminator? Read Also: What's the best poison for rats? Just because you see one, it doesn't necessarily mean that it is the only unwanted guest inside your house. Bear in mind that like mice, rats prefer to live under our radar. Seeing one could mean that the rodent population in your home has seriously blown out of proportion—forcing other rats to move out of their hiding spots. The presence of rat infestation can bring multiple problems to you and your family. Rats are known carriers of various bacteria and viruses that cause several serious diseases such as Leptospirosis, Salmonellosis, and Tularemia. The presence of rats also pose a serious threat to the structural integrity of your home. Be it a Norway rat or a roof rat, these rodents simply have no respect for your property. They chew or gnaw on just about anything that comes in their way. They are more than capable of punching holes through your walls or ceilings to give them easy access to identified food sources and quick tunnels back to their nests. One adult female rat can produce 5 to 7 litters per year. What's even worse—these litters only take about a month to mature fully and produce their own sets of offspring! Simply put, a small-scale invasion can easily get out of hand in a short period of time. Lastly, it's difficult to deal with the problem on your own, since rats have been known to avoid any new object set alongside their established paths inside your house. Want to skip all this research and just hire a decent exterminator for your rat problem? Rats destroy your house, litter your living space, and put your family's health at great risk. More importantly, their population can easily balloon to overwhelming figures when they're left unchecked and unchallenged even for a short period of time. When faced with such a problem, it is important to ​determine the right time in calling for expert help. ​Can I do it myself? By setting live rat traps and glue boards in strategic locations inside your house, you can catch a rat or two at least a few days of setting them. Keep in mind that rats don't like moving around in open spaces, so set your traps parallel to the wall or alongside identified rat holes within your property. But catching a few rats is entirely different in eradicating an infestation. Furthermore, DIY rat traps are not so successful in catching these troublesome rodents. Read Also: What're some good ultrasonic (noise) pest repellers? Time is of the essence in effectively putting an end to rat infestation in your home. Therefore, it's important to be alert in spotting significant clues that will confirm the presence of the problem. The first and most noticeable sign of a rat infestation is the presence of droppings scattered along the pests' foraging paths. A single rat can produce 20-40 droppings a day, depending on their eating habits. These pellet-shaped droppings are about 10 mm in length with rounded tips and dark brown color. Rats are quite active in the evening. If your home is infested with rats, you're most likely hear some scratching and running noises inside your walls, in the attic, and in your basement. Rats gnaw or chew on just about anything—not because they're always hungry. These rodents are cursed with continuously growing teeth, which need to be trimmed from time to time. This results to bite marks that can often lead to serious damage on some objects inside your house such as electrical wiring and furniture. If you see any of these clues, it is best that you call for expert help from a trusted rat control company as soon as possible. ​The total cost of rat removal service depends on several significant factors. This includes the size of the property, severity of the infestation, and the extent of damage in your property warranting immediate repair. Depending on the surrounding circumstances, the average total figure in hiring a rat exterminator can sit somewhere between $100 to $500. In some more serious cases and considerably larger properties, however, the cost can reach over a thousand dollars. For light infestations, you are most likely going to need (at most) two visits from your rat exterminator. The first visit will cover the inspection phase in addition to setting the traps. After two to three days, the exterminator will return to your property to clear the traps along with the rodents caught inside. This range usually covers rat extermination services intended for more serious cases of rat infestation. This is also offered for larger properties with somewhat lighter infestations but need more area covered. The rat control company will make at least three to four visits to your home to conduct inspection, set traps, clear the rats, and seal up entry points to prevent infestations in the future. For the most serious cases wherein the property has already suffered extensive damage on various key areas, a more complex rat control treatment is required. Properties with large attic and basement areas most likely fall into this category. The rat exterminator will conduct a few service visits to set a significant number of traps, apply an appropriate volume of rodenticides, conduct multiple clearing operations, along with some maintenance and preventive services. Don't panic. As soon as you realize that you have rat infestation inside your house, you should gather all possible critical details that would best describe the problem at hand. The rat exterminator that you are about to call still doesn't have an idea on the surrounding circumstances of your problem. Before you call for expert assistance, make sure that you are already equipped with all the necessary information that will help the exterminator deal with the problem more effectively. Rat control should be initiated at the soonest time possible and at the right places. Just because an inspection is part of a rat control service, doesn't mean that you can't do a DIY inspection beforehand. Pre-examination prior to an actual service inspection is critical. This can give the exterminator a good advantage over the pests and work on the traps more efficiently on the big day. Key areas of your home that are most likely invaded by rats are the attic, inner wall spaces, basement, kitchen, and garage. Other key areas to consider are your garden and tool shed. ​When did the infestation start? This basically depends on how keen you are in watching out for signs of infestation. Considering the rodents' breeding behavior, it's important to take notice of the infestation in its earliest possible stage. Sometimes, though, you don't even need any of these classic warning signs. To see what we mean, check out the video below (if you dare)! Rats, being top carriers of germs and disease, give off an unpleasant smell inside your home. Since these pests like living in moist places or at least near water sources, you are most likely to notice a lingering musty or moldy scent especially in frequently visited areas of your property. Rat urine, on the other hand, smells like most men's aftershave products. And this musky scent gets even stronger—you guessed it—in confined spaces. Read Also: How do you get rid of the smell of a dead rat? Basically, the sound of rat infestation is comprised by the noise produced by rat activity. And since rats are nocturnal animals, these noises are often heard in the dead of night...or at least as soon as the lights are off. Rats nest behind walls, so you're most likely going to hear squeaking and scratching sounds coming from these areas. Rat infestation also produces those scampering sounds in the attic or in your kitchen area, as if the rodents are playing hide and seek. As infestation worsens, these noises tend to become more intense and more disturbing—which can deprive you of a relaxing sleep every night. Rats feed on meat as much as they like eating fruits. In fact, they munch on all types of food that can be found in your kitchen, including your pet's favorite treats. With their powerful teeth, rats can easily tear open almost any kind of food packaging, leaving a trail of evidence scattered on your kitchen floor in the following morning. Rats will look for just about anything to curb their insatiable appetite, and the tougher the better; since their front teeth never stop growing, crunchy foods can "trim" their incisors to avoid a painful growth in their mouths. ​When all else fails (especially if you are a DIY type of person), your next best option would be to call for professional help. Here are some important factors to consider to help you find the real experts who are capable of helping you get rid of your rat problems for good. The right people to handle the job are the ones who work with complete documents to back their legitimacy as rat control specialists. Never hesitate to ask if the company is a registered business with license to carry out rat control services in your area. Check if all of its crew are trained exterminators with supporting certificates. Also, be sure to cross-reference your findings with the Better Business Bureau (BBB). This way, you'll have a federally-backed system to confirm the legitimacy of your prospective pest control company. Politely ask for the company's list of previous customers and from this list, choose at least three or five people and give them a call. Ask their experiences with the concerned company and if they are satisfied with the service provided. If somehow this is not possible, ask a couple of neighbors, friends, or relatives for some recommendations. However, a reputable pest control company should be able to provide an ample list of previously service clients who would be happy to vouch for them at any time. In the event that they can't provide any references, use this as a factor in determining what not to look for in a pest control company. It's also important to consider the exterminator's experience in the industry. This should comprise the number of years the business has existed as a rat control company as well as its professional work track. The professional experience of the exterminator will serve as your assurance that your rat infestation problem is handled by someone who has already tackled the same task many times over. ​Apart from rat traps, rat exterminators also use rodenticides to effectively eliminate the problem. More commonly known as rat poison, rodenticides nowadays are often used through bait stations. These pesticides either contain diphacinone, chlorophacinone, or bromethaline. ​Depending on the specific type of chemical used, the rodenticide acts in various ways. Your rat exterminator should be able to provide his clients with clear copies of rodenticides he is planning to use. This should also include the product's registration number, restrictions, and other essential details. Guarantees are offered by rat exterminators as a formal assurance to their clients regarding the overall efficiency of their rat control solutions. This is usually offered in the form of a warranty which can cover various lengths of time from months to years. In a warranty, the rat exterminator is expected to provide a repeat of the treatment for free should rats reappear within the specified time. Simply put, the longer the warranty, the more protection you have for your property. The required number of service visits by a rat exterminator depends on the size of the property and the identified total number of rats inside the property. Generally, the exterminator discusses this with the client right after he or she has conducted the inspection phase. It's critical to understand the severity of the infestation before making any decisions which can affect the long-lasting terms of a service agreement, which is why there is no real "one-size-fits-all" pest control experience. For homeowners with pets, it's optimal to inform the rat exterminator about the situation right from the very start. This way, the company will be able to suggest pet-friendly alternatives that still have the same efficiency against your rat problems. Here's the good news: most rat control treatments these days don't really pose a serious threat to your pet's health. Rodenticide used by rat exterminators is often secured in tamper-resistant bait stations. You'll have to keep a constant eye on your pet(s) to make sure that they don't drag the bait stations to other places for curiosity's sake. ​Most rat control treatments are comprised of multiple service visits. In these visits, the exterminator will conduct constant monitoring from time to time while simultaneously clearing the premises of dead rats. After the last service visit from your rat exterminator, the best thing for you to do is to observe your property for any further rodent activity. If your rat control service comes with a warranty, it's important to report any signs of surviving rodents in and around your property. If this happens within the covered time of the warranty, your rat exterminator will be obliged to provide an additional service visit at no extra cost. ​Some rats establish their nests outside residential properties. T​his means that your neighbors could also be at risk of rat invasion or that an infestation could already be on its way under their roofs. Giving them a heads up prior to having rat control treatment inside your house can significantly lessen the chances of any surviving rats to establish new nesting grounds. A teamwork effort with your neighbors can help secure a rat-free neighborhood. Rats are unnerving rent-free tenants at best and disgusting carriers of disease at worst. When you figure out that you've got a rat invasion in your home, don't let the problem balloon to epic proportions—be sure to call an exterminator as soon as you suspect that you may have an uninvited guest. The sooner you are proactive about your rat problem, the sooner you can go on with your life—totally vermin-free. 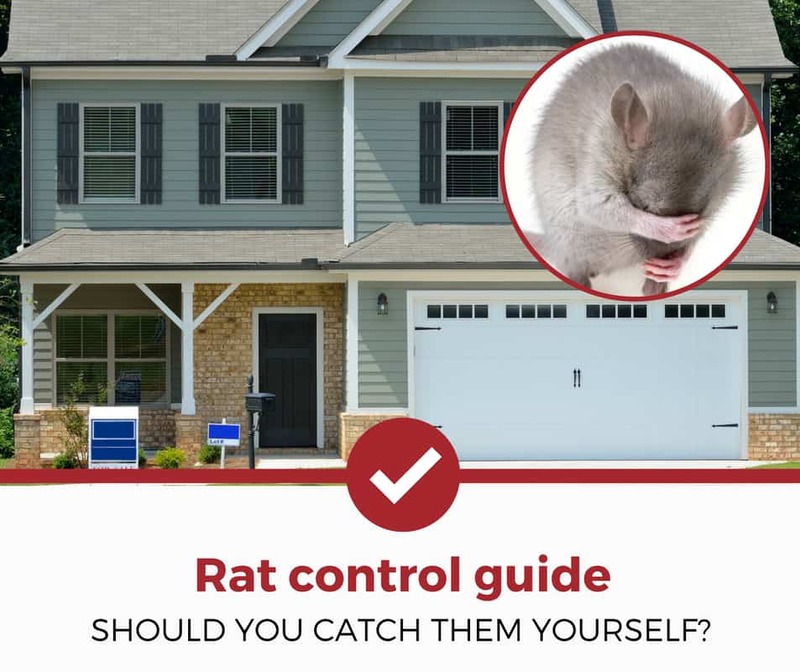 Our guide aims to give you the tools, skills, and information to call a qualified pest control specialist and kick your rats to the curb today. Curious about other rat related articles? Check out our other detailed guides to help you deal with your pest problems. I have rats and mice in my house and holes they are also in the walls.